How about a current time button? 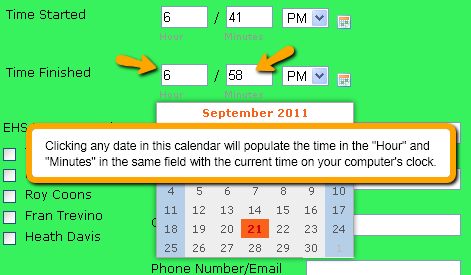 The date&time section allows for the time to be turned off. What if I want the date turned off? I use my JotForms for completing inspections on my moble device, and on certain items, I would like to know the time when certain opeerations begin. It would be helpful if there were a load button with the time i could click to get the current time, almost like a stopwatch, i press the time refresh for one to have a start time, then another time button for the end time and so forth. This gives me an active, interactive inspection form. Thanks for asking. It's an interesting question. The thing is, I don't know if I have an interesting answer to match! CSS can be injected into the form to hide the date part of the DateTime fields and the DateTime tag in the notification can be altered to display just the time but the submission records for the form will still show the full date and time. Here is a clone of your form which you can clone in turn to examine its CSS and appended tag. P.S. I forgot to mention that you will need to replace "user@example.com" in the Recipient E-mail field of the notification with your email address. Hey, this is awesome. Thanks! We're always happy when solutions provided meet or exceed our users' expectations, EHSForms.